This is the page where information on the ongoing artistic research trajectory "Extending Opera" is published. 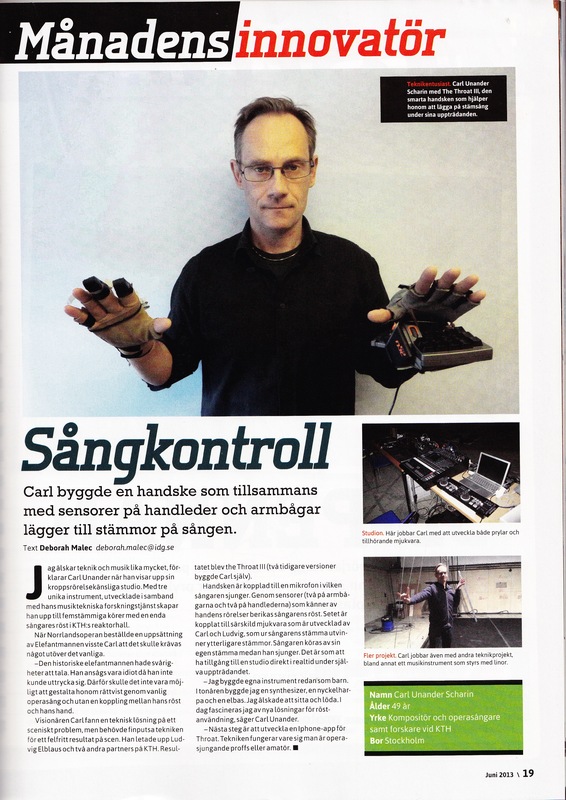 Extending Opera – Artist-led Explorations in Operatic Practice through Interactivity and Electronics. How can we re-empower opera singers, extending their control over accompaniment and vocal expressivity? To answer this question, I have opened a novel design space, Extending Opera, consisting of interactive artist–operated tools to be used on-stage. The research has its methodological groundings in Research through Design (RtD) and Research through the Arts (RttA). This particular method is coined "research-through-the-art-form-opera" – as I have worked within the realms and traditions of opera, probing its boundaries by designing, researching and creating through its own artistic toolbox. Originally conceived for personal use, the artifacts were later used by other singers and incorporated in performances of opera in small and large scale. By composing and designing for the requirements in operatic productions, high demands on robustness were explored in and through custom-built interfaces. 1. How can the design and creation of interactive, artist-operated instruments be informed by deep musical knowledge and be probed by the particular conditions surrounding an operatic production? 2. What impact can interactive, artist-operated instruments have on the opera singers themselves and on their vocal technique? 3. How can interactive, artist-operated instruments empower opera singers, thus challenging contemporary power hierarchies – thereby reconnecting to the explorative practice in opera's early days? My knowledge contribution has surfaced through artistic practice and consists of the exemplars and the artworks, as well as three abstractions – one procedure, one requirement and one experiential quality. Sensory Digital Intonation highlights how the fine-tuning of technologies and real-time interactivity is incorporated in a feed-back loop with artistic concerns and creativity. Performative Stamina ("The Premiere-Factor") highlights how the traditional procedures leading up to a premiere in opera influence the demands on robustness and reliability within the components and the overall design of the novel artifacts. 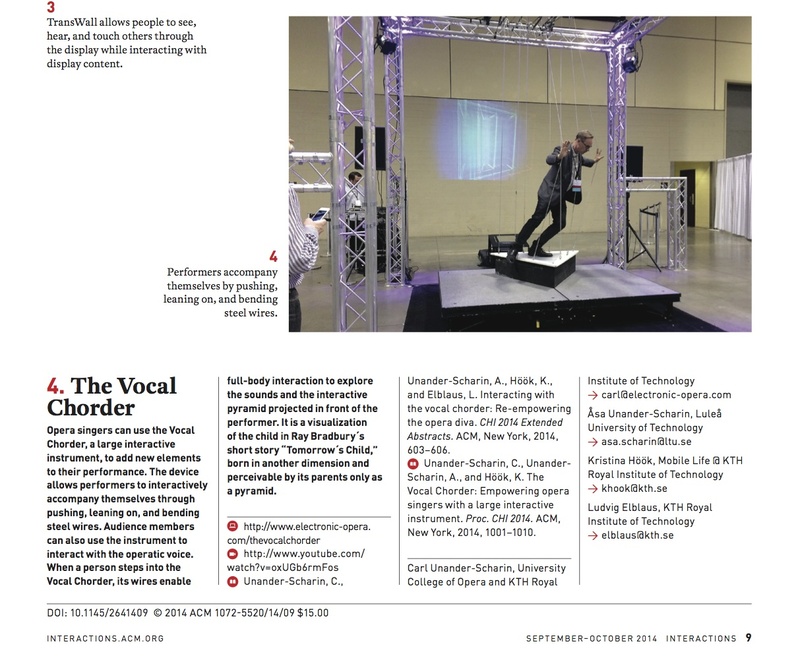 Vocal Embodiment is an experiential quality that describes how the interactive artifacts change the singing itself. In the conclusion, Artistic Re–Empowerment is discussed, proposing that power structures in opera have been probed through the use of the novel artist-operated interactive instruments. 12. 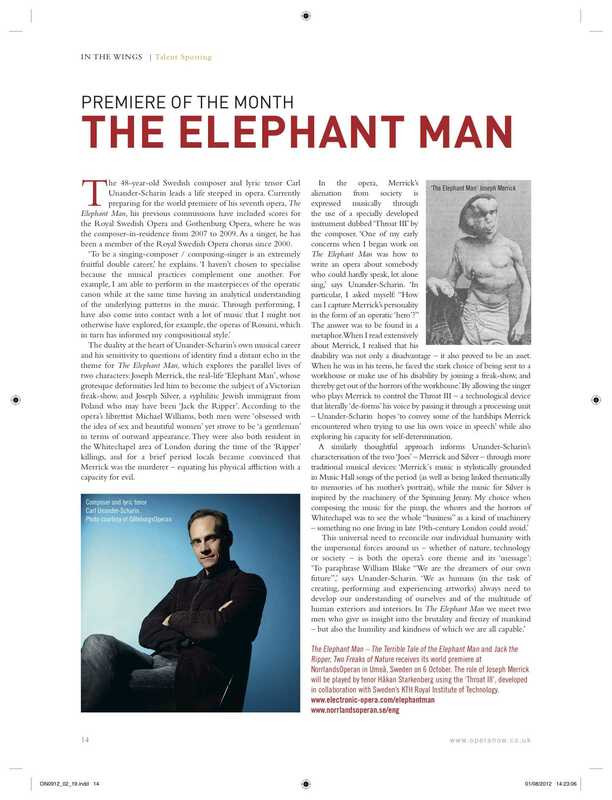 Opera Now, London: The Elephant Man - Premiere of the Month. 18. Robocygne - Dancing Life into an animal-human-machine, Leonardo, MIT press 2016. 19. CARPA 4: Which scenic subject may emerge when interacting with machines through vocal and bodily virtuosity? The Throat III - Disforming Operatic Voices through a Novel Interactive Instrument. Liens from Calligrammes, Swedish Radio Choir, Peter Dijkstra, Berwaldhallen 2017.